^ （英文） Conifer Specialist Group (2000). Araucaria araucana. 2009 IUCN Red List of Threatened Species. IUCN 2009. 撷取於2009-07-28. 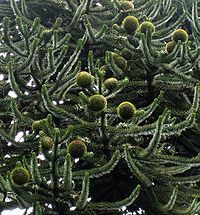 ^ Araucaria Araucana by Michael A. Arnold (PDF). （原始内容 (PDF)存档于2008-10-31）. ^ Araucaria araucana in Ålesund, Norway. Scanpalm. [2009-06-27]. （原始内容存档于2009-10-09）.